I remember the time when I had gone to an auto show and was sifting through the various cars and their booklets there. That when I first saw the Mercedes-Benz E 63 AMG in India. Nothing exceptional than the regular Mercedes other than the blacked out wheels and that snorting exhaust system. On one of those deep pocketed ones request, the demo person over there got into the car and pushed the button start system. Bwammmmmmmh! This was the sound that I heard and it literally echoes throughout the hall. Whoa! That made me understand that this one is no docile Mercedes E-class but a rip snorting beast. After about a year or so when I joined Indiandrives, I was reminded of this and requested my boss to fix an appointment with the Mercedes-Benz E 63 AMG. Ever the gracious boss, he arranged for one and thus began my tryst with this car. Mean machine. These two words would be sufficient to highlight the looks of this car. The 3 pointed star has taken its rightful position at top of the bonnet. The air dam has been widened whereas the grille has been kept the same. Those chipened intakes near the wheels and the LED daytime running lamps mean that this car is for serious business. The 19 inch 225/35 tyres at the front and 285/30 section tyres at the rear shows the intent of this car. There is a E63 badging at the sides. The rear section is normal E types with the exception of the twin tail pipes at both the corners of the bumper. There is also an air diffuser. The steering wheel for the Mercedes-Benz E 63 AMG in India is no different than the regular E-series car. The seats however are changed. They are now more inclined towards sportiness without losing any of the regular Mercedes traits of comfort. The drilled aluminum pedals are also keen on showing the sporty intent of this car. 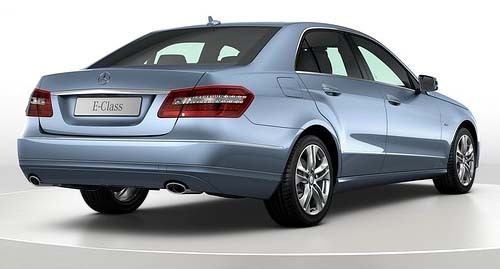 Unlike the E-class cabriolet, this car has space for 5 in all and can still carry their luggage around with ease. Other than this, the usual Mercedes gizmos abound inside the cabin and there are no changes or addition to those. AMG usually tauts the suspension of Mercedes cars so that they are able to handle better and also take in the extra power. There is a new axle as well as electronic damping. The track is increased to 56 mm by this new axle. Positioning enhancements, suspension travel, tubular stabilizer and new control arms provide for more cornering stability as well as increased camber. Air springs specially made to order by AMG replace the conventional struts in the front and the rear axle also makes do with automatic level control. As expected the setup was on the stiffer side but it was in the least back breaking. Body roll has been eliminated to the minimum and there are now 3suspension settings namely Comfort, Sport and Sport Plus. Steering set up has also been altered to make the car more responsive. The rack and pinion system has been made more sensitive whereas the steering ratio has also been re-geared. Traction control can also be switched off completely to enjoy the sideways action in this car. The talking point in any AMG derived car, the Mercedes-Benz E 63 AMG in India boasts of a 6.3 liter V8 petrol engine which pumps out 525 Bhp whereas the torque is also huge at 630 Nm. This is required to push the two tonne car from 0-100 kmph in only 4.6 seconds whereas the top speed is 250 kmph, electronically restricted. The transmission used is the AMG Speedshift MCT 7 speed auto transmission. This is actually the same one which can be found in the SL 63 AMG. This transmission is quick to respond in going with the character of the car and is a treat to use. No one would speak of fuel efficiency for an AMG car. But for the records, this car returns 7.9 kmpl on the city whereas on the highway it goes upto 9.8 kmpl. Braking is done via AMG made carbon fiber ceramic brakes assisted by ABS, traction control, EBD and ESP. 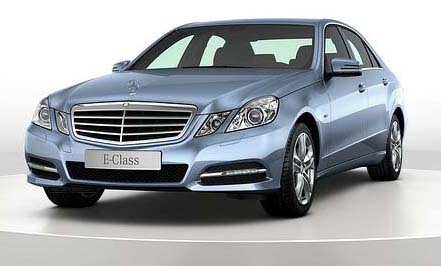 Safety is the standard Mercedes fare with no changes made to it. Now, this car is something which is really insane but at the same time you can drive it in normal traffic without skipping a beat. It is just that when you blip the throttle, it would be enough to scare away all those motorcyclists. It is comfortable for those Armani suits and at the same time, when in the mood can also cater to the racer boy in you. All said and done, the Mercedes-Benz E 63 AMG price in India is Rs 63.77 lakhs excluding taxes and duties. Go buy one and enjoy yourself.